The Home Plow from Meyer is meant to make your life easier when big blizzards hit. Once your receiver hitch is installed, putting the snow plow on your vehicle and taking it off can be accomplished in less than a minute. The included casters make moving the plow into your garage or storage area as easy as can be as well, so there's no need to worry about doing too much heavy lifting. When the plow isn't mounted, there is no connecting hardware left visible on your vehicle, allowing your ride to retain a neat and clean appearance. When it comes to picking the right Meyer Home Snow Plow for you, there are three options to consider. 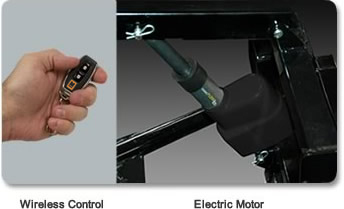 You can order one with an electrically powered lift with wireless controls, which can be moved up or down using a wireless control unit that can snap conveniently onto a key chain, and utilizes Meyer's own Auto-Angling system for left and right movement. The hydraulically powered lift comes with wireless and wired controllers, and is slightly quicker than its electric counterpart. For full remote control, you'll want the fully hydraulically powered option. Stop by our showroom in New Hope Minnesota to check out our Snow Plow Options Today. Delivery is available to all 50 states. Free or discounted shipping available to some areas of MN and surrounding states but please call us for a shipping quote before placing your order. Learn about all of the available snow plow models below - After that, if you have questions or need assistance our support team is available to help customers figure out which plows are compatible with your vehicle model. You can also fill out our compatibility form HERE and we will quickly be get back to you and suggest the right models for your vehicle. The HomePlow Basic is an 18″ tall economical plow for the person that wants to move snow quicker than other snow removal methods. The up/down motion of the moldboard is controlled by an electric power unit that is activated by a wireless key fob. 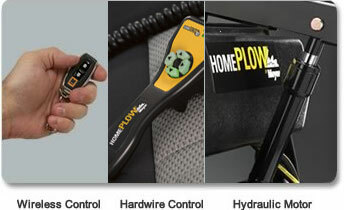 The right/left motion of the plow is controlled by the HomePlow’s patented Auto-Angling™ system. Requires assembly with common tools. Theup/down motion of the 22″ tall moldboard is controlled by an electric power unit that is activated by a wireless key fob. 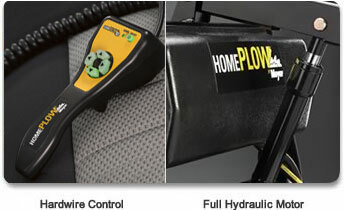 The right/left motion of the plow is controlled by the HomePlow’s patented Auto-Angling™ system. Unlike other snowplows, there is no need to manually adjust the blade. Slightly faster than the electric motor version, this power option controls the up/down motion of the 22″ tall moldboard with a hydraulic power unit that is activated by an in-cab controller. 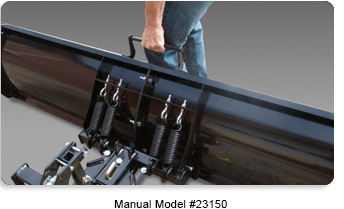 The right/left motion of the plow is controlled by the HomePlow’s patented Auto-Angling™ system. Unlike other snowplows, there is no need to manually adjust the blade. To accommodate your preference, included with this model are both the wireless and hard-wired controllers. As the only fully automated snow plow on the market at this low price that allows users to control all operations from the warmth, comfort and safety of their vehicles. While the blade and hardware are nearly the same on all versions of the HomePlow, there are various power options for controlling the plow blade. For people who want full remote control of all functions, this hydraulically operated version of the HomePlow is controlled by a hydraulic power unit that directs both the up/down and right/left motion of the 22″ tall blade. With full power control, the driver can move the blade in the desired direction with just a push of a button. This popular version of the HomePlow is the most like a traditional commercial snowplow. For people who want full remote control of all functions, this hydraulically operated version of the Meyer Home Plow is controlled by a hydraulic power unit that directs both the up/down and right/left motion of the blade. With full power control, the driver can move the 22″ tall blade in the desired direction with just a push of a button. This popular version of the HomePlow features a 7’6″ blade length and is the most like a traditional commercial snowplow.